How to navigate the academic portion of game day and game day activities. The No. 16 UCF Knights will go head to head against the FAU Owls in Spectrum Stadium at 7 p.m. on Friday, Sept. 21, for a nationally televised game on ESPN. UCF owns the longest winning streak in the nation, now at 15 games, and is the highest-ranked team in Florida and the top team in the American Athletic Conference. The following information will help navigate the academic portion of game day and then game day activities. Classes on the main campus, in the Central Florida Research Park, Rosen College of Hospitality Management and on UCF Connect’s campuses will conclude at 2:30 p.m. Offices at those locations also will close for normal operations at 2:30 p.m. in order to allow adequate time for a smooth transition to game day activities, which will begin at 3:30 p.m. on most of the campus. Faculty who have classes in progress at 2:30 p.m. may choose to conduct the portions of those sessions that come before that time. Some staff members may be required to work past the university’s 2:30 p.m. closing time. Please speak with your supervisor about operations in your specific area of the university. In order to provide students with additional time to study, the John C. Hitt Library will remain open until 5 p.m. Additionally, many UCF Dining Services locations will remain open after 2:30 p.m., including Knightro’s and ’63 South, which will be open until 9 p.m. and 10 p.m., respectively. The university will reopen for normal operations, including regular class and activity schedules, at 6 a.m. Saturday, Sept. 22. Regular university-parking policies will be in effect until 2:30 p.m. Faculty, staff, and students will be able to stay in many campus parking lots and garages after classes have concluded. Those areas include garages A and B, as well as surface parking lots B5, B6, B9, and H4 with respect to your designated permits. Those who possess a game day parking permit may remain parked in their designated football Gold Zone lot or garage throughout the day as long as their game day permit is displayed. Beginning at 4 p.m., all vehicles without a valid game-day permit in garages C, D, F and H as well as the baseball lot and parking lots C1-C3, D1-D2 and E1-E8 will be subject to towing. Regular weekday student-shuttle routes will switch over to game-day operations at 5 p.m., and game-day shuttles will continue to run for two hours following the game. Fans should park at the Research Pavilion, 12424 Research Parkway in Central Florida Research Park. Shuttles will transport fans from the Research Pavilion to parking lot D1. No tailgating will be permitted at the Research Pavilion. The game-day shuttles will include all regular student-shuttle routes with the exception of Tivoli, Northgate and Northview, due to their close proximity to the stadium; services to these three communities ends at 5 p.m. The Rosen College shuttle will depart from that campus at 3 p.m. and will leave from the main campus’s student union at 11:30 p.m.
Gemini Boulevard North between East Plaza and West Plaza drives will be closed to vehicular traffic prior to and during tailgating. The road will be reopened at the discretion of law enforcement following the conclusion of tailgating. To expedite postgame traffic, North Orion Boulevard will only be open to traffic traveling from Gemini Boulevard to McCulloch Road starting at 8:30 p.m. until postgame traffic is cleared. Vehicles will not be able to enter campus from McCulloch Road during that time. 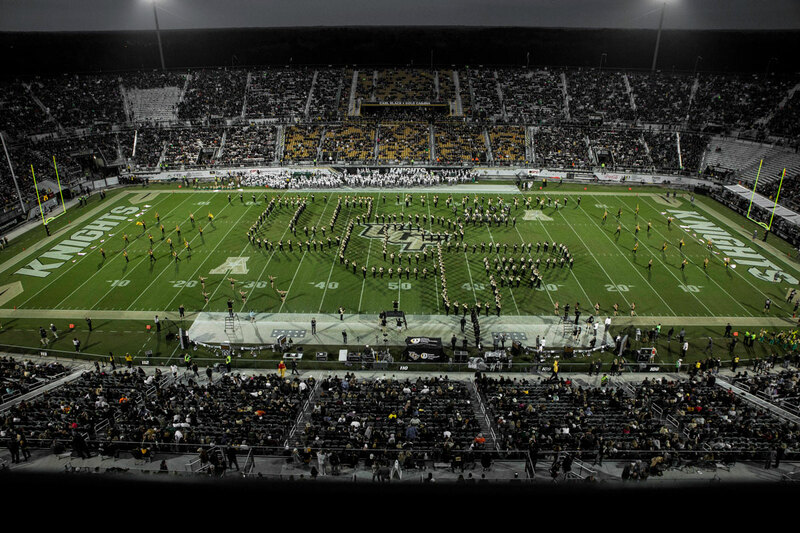 A limited number of tickets remain for Friday’s game and can be purchased online through UCF. Season tickets are available for the remaining UCF home games. UCF faculty and staff are eligible to receive 20 percent off the ticket portion of season tickets. Many sections at Spectrum Stadium have already sold out, so don’t wait to get your seats. To order, call 407-823-1000. UCF students can claim their free ticket through Friday through UCFStudentTix.com, but please note that claiming a ticket does not guarantee entry. Early arrival to the stadium is strongly encouraged. Once students arrive at the gate, they must have their UCF student ID and mobile ticket. Student guest tickets officially sold out Tuesday afternoon. 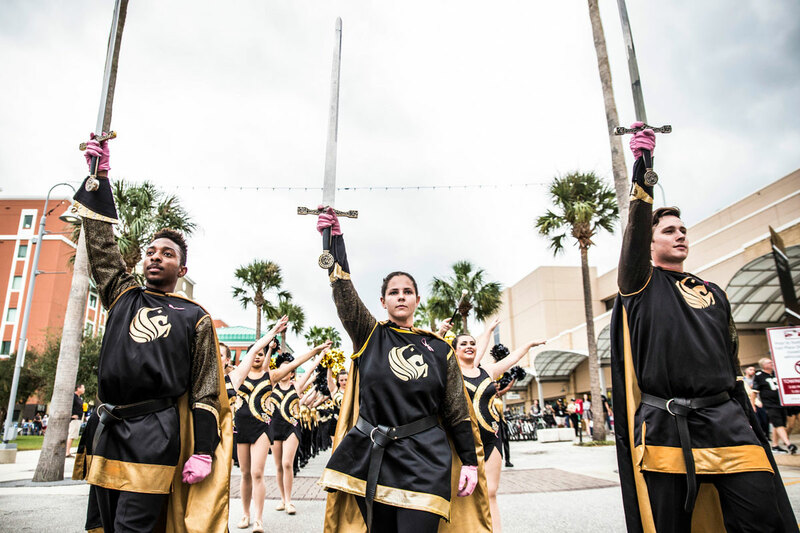 Remember, if 50,000 students attend home games before Nov. 9, UCF President Dale Whittaker has promised to accept UCF Director of Athletics Danny White’s challenge to join in UCF Homecoming’s tradition of Spirit Splash. #UCFansWear is looking for a blackout at Spectrum Stadium, so all Knights fans should gear up in black. Tailgating on campus starts at 3:30 p.m. The main act for the UCF Tailgate Concert Series presented by Pacifico is Keith Eaton, who will take the stage in IOA Plaza at 5 p.m.
Don’t forget, a clear-bag policy is in effect and it’s important to know your gate of entry. Express lanes are available for fans who don’t have any bags. These can be found in all lanes for gates 5 and 9 and some lanes in gates 12, 13 and 18. The clear-bag policy is effective for all sporting events at Spectrum Stadium. While fans are encouraged to not bring any bags, those that do can review the policy on ucfknights.com. For additional information on game-day policies and procedures, please visit: www.UCFGameDay.com.